Nearly 600,000 people lost homes, jobs, and access to goods and services as Typhoon Mangkhut pummeled the northern island of Luzon, Philippines on September 15 and 16. Even as our search continues for survivors in isolated villages, Catholic Relief Services is responding to immediate needs and is prepared to respond to long-term recovery efforts. Landslides and flooding have wiped out homes, shelters, roads and bridges—blocking access to emergency responders and endangering survivors. In Tuba, Benguet Province, 25 houses were destroyed or washed away. Other houses remain hanging on cliffs that are in imminent danger of collapse, imperiling the families living there. Ramilyn Estimada lost her home and everything in it. Her family took refuge in her aunt’s house during the storm and they remain there, waiting to decide what to do next. “It’s difficult and heartbreaking, but life must go on,” Ramilyn says. She worries for her family as her husband’s source of income is the river. He earns money collecting boulders from the riverbed to sell to contractors, but that line of work is now incredibly risky--water is raging and additional landslides are likely on the steep banks. Ramilyn hopes to soon have a housing option other than staying with family, but is waiting to see what kind of shelter assistance will reach her area. Along with homes, bridges and roads, Typhoon Mangkhut destroyed 80 to 90% of rice and corn crops—severely jeopardizing long-term food supplies—but also devastating farmers who live close to the poverty line and who were counting on their upcoming harvest. 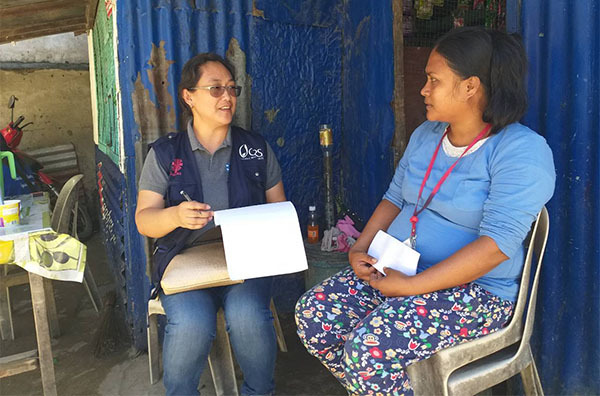 Catholic Relief Services is aiding families like Ramilyn’s with water purification and storage kits, shelter kits and cash transfers to meet immediate needs, and is also prepared to assist in long-term recovery efforts. Nearly 1.6 million farmers and fishermen/fisherwomen were also affected by the storm—helping them weather this shock and rebuild their incomes is a top priority.